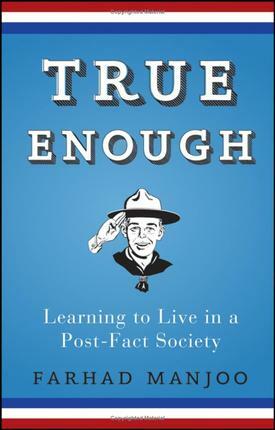 Farhad Manjoo's True Enough: Learning to Live in a Post-Fact Society is a breezy-but-engrossing look at the increased polarization of news in the 21st Century. Manjoo convincingly argues that our own capacity for selective perception (show two groups of partisans footage of a political debate and both will swear it was biased for the other side; show the same footage to someone who doesn't care and they won't see bias for either side) combined with the Internet's capacity to network affinity groups and spread fragmented, selective media are a perfect storm, with the truth right in its path. Manjoo makes a good case. He walks through a number of net-based conspiracy theories on both sides of the political spectrum, speaks with their adherents, the experts who claim it's all bogus, and then to cognitive scientists and other scientists who explain the gigantic gap between what is so obvious to non-partisans and what is blindingly, passionately important to the adherents. Grounded in history and science, True Enough paints a dismal picture of a species with a limitless capacity for self-deception and selective reasoning. But Manjoo doesn't ascribe the rise of truthiness to fragmented media alone: he calls out PR firms, media outlets and others who have profited from the erosion of the truth. I'm more-or-less convinced by Manjoo's idea that reality itself has fragmented, that many of us "know" different, mutually exclusive "facts" about the world, but I'm not so sure that this is an outcome of a networked society. For centuries, a large number of people "knew" that Jews used gentile baby-blood in Passover matzoh. They "knew" that phrenology worked. That gypsies stole babies. That the laboring classes lacked the capacity to learn and participate in society. That women had fewer teeth than men.